Lodi, Medicine Lodge, Painted Post, Sexton and Sun City. Elm Mills Township, Barber County, Kansas. Map drawn by George Miller. 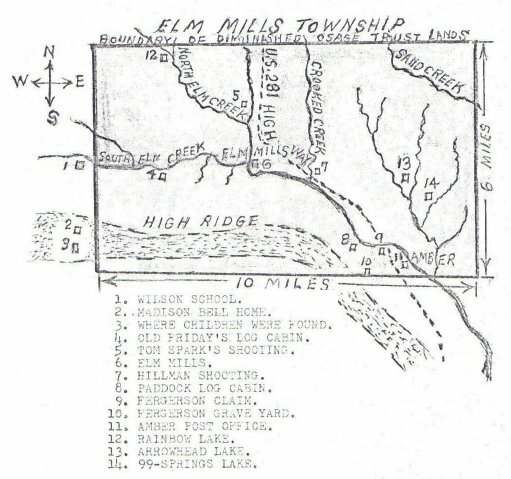 “I have a small booklet titled “Some Elm Mills History Copied by George Miller from Barber County Historical Files of Library at Medicine Lodge.” It outlines several things that happened in the Elm Mills Township, one of which was the Hillman matter. This map is from a page in that stapled booklet. Apparently Mr. Miller (of Sawyer, Kansas) drew this diagram and plotted the happenings on it. – Email from Kim Fowles to Jerry Ferrin, 7 March 2006. USGS topographic map showing a part of Elm Mills Township, Barber County, Kansas. showing the location where a man said to be John W. Hillmon was shot and killed. 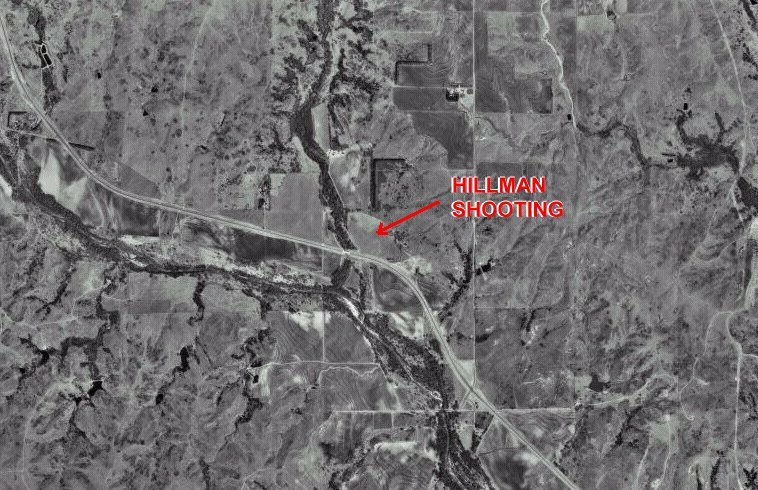 USGS aerial photograph, 21 March 1996, of a portion of Elm Mills Township, Barber County, Kansas, showing the location where a man alleged to be John W. Hillmon was shot and killed. Detail of the G.A. 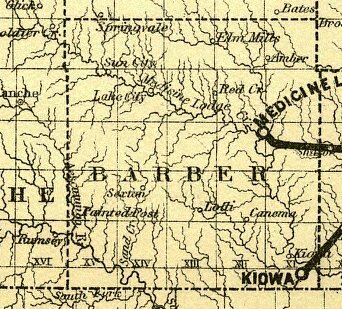 Ogle Publishers & Engravers 1905 map of a portion of Elm Mills Township, Barber County, Kansas, showing the location where a man alleged to be John W. Hillmon was shot and killed. 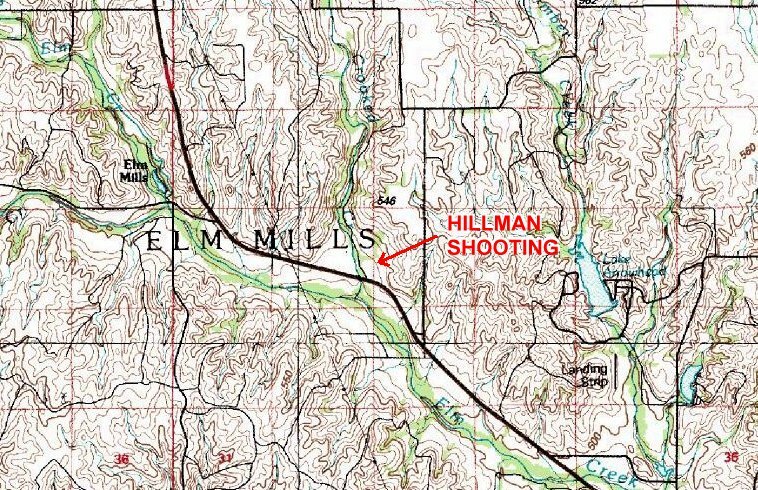 Based on George Miller’s identification, the shooting probably took place on the highlighted 40 acre parcel of land owned by Wm. Riggins. 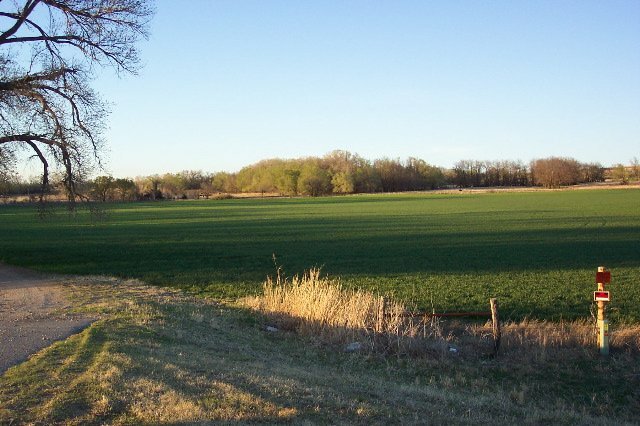 View of the field identified by George Miller as the location where the Hillmon shooting took place. Looking north to northwest from just east of the bridge over Crooked Creek. Photo taken 8 April 2006, courtesy of Phyllis Scherich. View looking north to northeast from the driveway area just east of the Crooked Creek bridge. 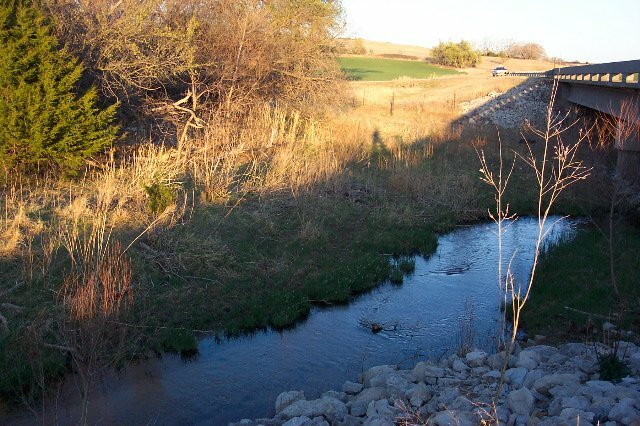 View of Crooked Creek near the place identified by George Miller as the location where the Hillmon shooting took place. Photo taken 8 April 2006, photo and comment courtesy of Phyllis Scherich. View of Crooked Creek and Crooked Creek Bridge Near Where the Hillmon shooting occurred. 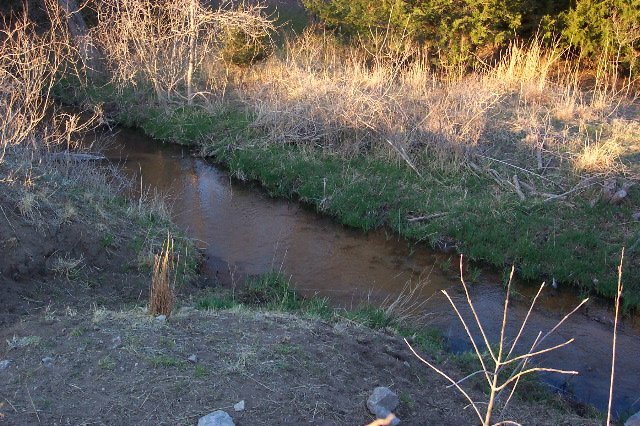 “View showing the creek in relation to the bridge and field. Obviously none of the trees were there at the time of the “accident”- but this area looks like it would have made a good place to camp- especially the area where the home is located now. Thanks to Kim Fowles for finding and contributing the above Miller and Ogle maps, to Phyllis Scherich for the photos of the area where the shooting took place and to Jerry Ferrin for his map interpretation and graphic design of the comparative maps and photographs. 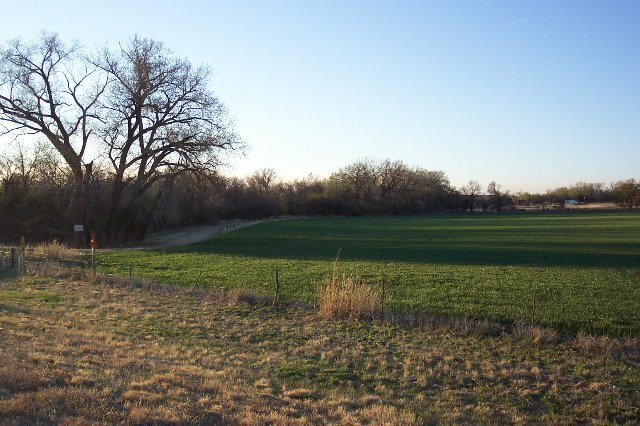 This collection of photographs and maps was originally published as the Maps and photos of the shooting location in the Hillmon case web page on the Barber County, Kansas: History & Genealogy web site by Jerry Ferrin on 16 March 2006.